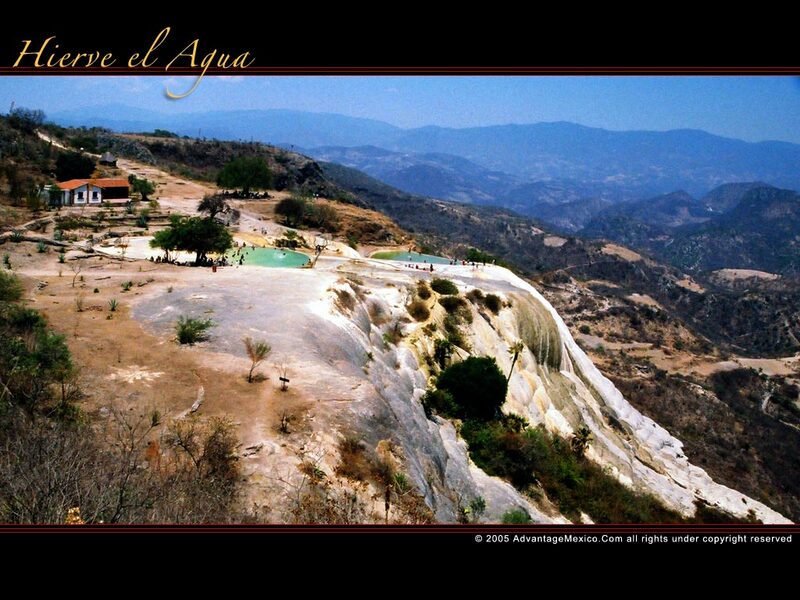 Hierve el Agua is a natural warm spring which contains air trying to escape, hence the name "Hierve el Agua"which means “the water boils”. The water is also full of minerals, so as it runs off of the edge of the nearby cliff, calcium carbonate and magnesium in the water create a petrified waterfall, and the sulphur ads nice yellow accents in places. There are only two such sites in the world, the other one is in Turkey. 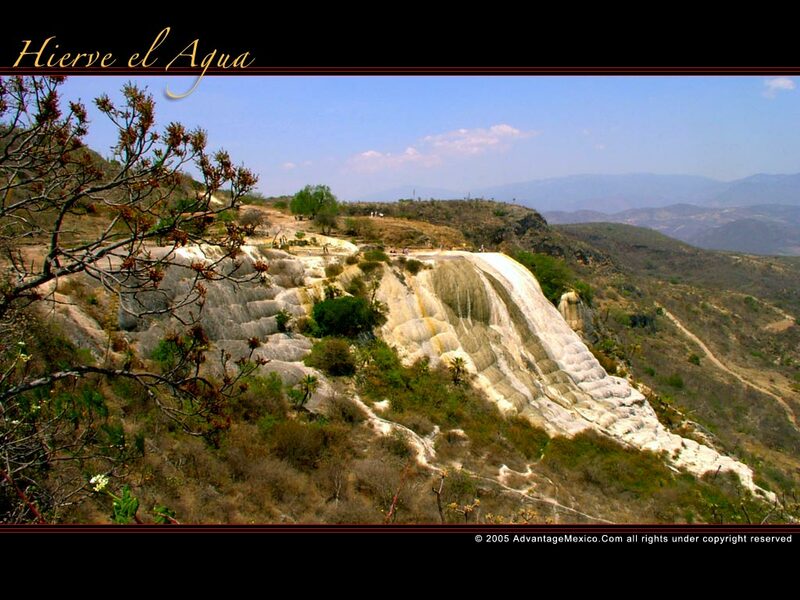 Archaeological evidence suggests that the springs at Hierve el Agua were first used about 2,400 years ago. The early inhabitants constructed wells approximately every three meters along canals used for watering terraced crops. 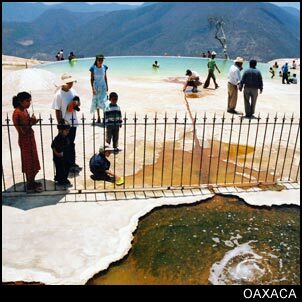 The Hierve el Agua springs continue to flow through the ancient canals at a rate of 2 liters of water per second in the dry winter months, and more in the summer. If you get hungry while visiting Hierve el Agua, there are comedores on-site and there is a small restaurant about 100 meters away that serves a daily special. If you want to stay overnight, there are inexpensive one room bungalows nearby, but reservations should be made through sedetur (Secretaria de Desarrollo Turistico) first (phone: 51 42155). People who have stayed overnight at Hierve el Agua will tell you that it is one of the best choices they could have made. If you do plan on staying, be sure to catch the view at sunrise (if you can get up that early). Word from recent travelers is that the government owned bungalows provide only a sheet and a thin blanket, so be sure to bring some warm clothes as it can get pretty cold there at night. The Fletes y Pasajes Bus line at the second class bus station leaves every morning at 8:00 am and returns at 2:00 pm. The two and a half hour trip will cost 30 pesos each way, and the entrance fee is 10 pesos. 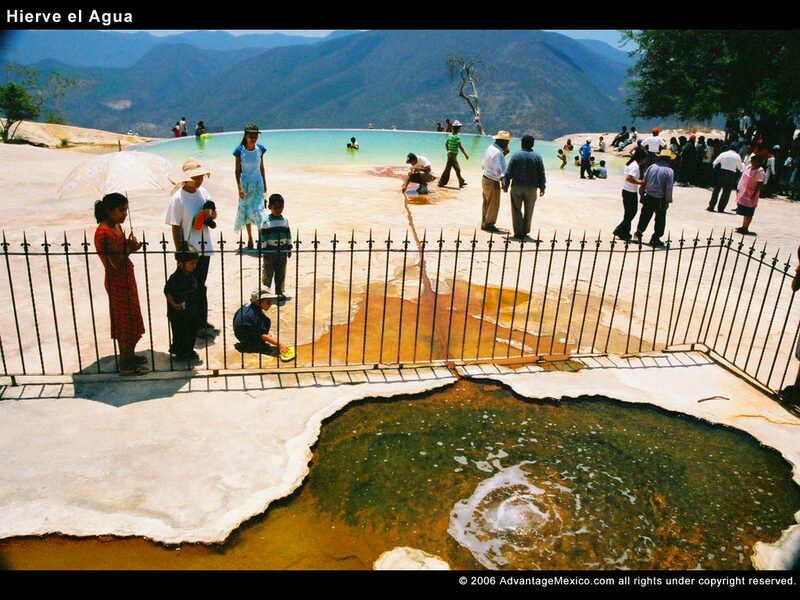 A second option is to take the bus to Mitla and catch a camioneta going to Hierve el Agua.